Your first stop should have been at Robin Lane's Blog, if you did not start there please go back to the beginning. What is Rett Syndrome? Rett Syndrome is a devastating neurological developmental disorder that occurs almost exclusively in girls. It is usually caused by a mutation of the MECP2 gene on the X chromosome. Rett Syndrome is found in all racial and ethnic groups throughout the world, and in every socioeconomic class. Rett Syndrome affects 1 in 15,000 female births. Early developmental milestones appear normal, but between 6-18 months of age, there is a delay or regression in development, particularly affecting speech, hand skills and coordination. A hallmark of Rett Syndrome is the repetitive hand movements that may include seizures, irregular breathing, swallowing difficulties, and curvature of the spine. Many individuals with Rett Syndrome live well into adulthood. This hop will take place today (Saturay, Oct. 27, 2012) and Sunday (Oct. 28.) There are 25 of us who have some sort of Disney project to share with you all, so make sure you hop both days. You don't want to miss any of these amazing projects! You should have come from Jamie's blog. If you didn't, please go back and start from the beginning. Before I got involved in this Blog Hop, I had no clue what Rett Syndrome was. Never even heard of it before. One of the many reasons I wanted to be involved was to hopefully bring more awareness to others who also may never have heard of it before. This is something that could effect any girl (or possibly boy) you know. Please consider passing the information along. 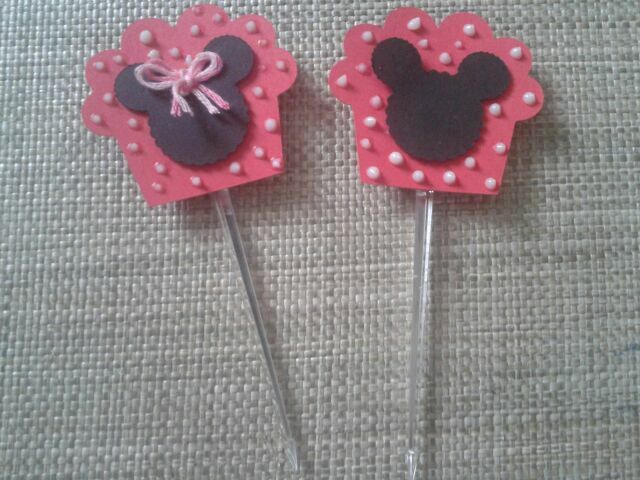 Today, I chose to make Mickey and Minnie Mouse cupcake toppers. My God-Daughter just had her 2nd birthday in which she had a Minnie Mouse theme. You don't have to use these for a birthday though, you could really use them for almost anything, or even "just because." I don't have any specific Disney cartridges, so I had to make my own Disney character. I just simply welded three scalloped circle shapes together to make Mickey and Minnie heads. I cut twelve out total. 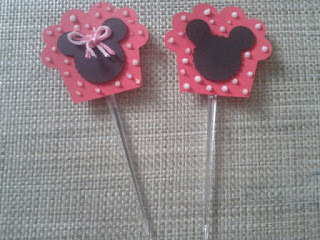 Six are Mickey, and six are Minnie, but you could obviously do any combination that you wanted. The hardest part of this whole project for me was tying the bows. 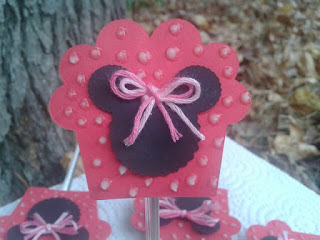 I used two shades of pink embroidery thread, but ribbon or twine would be adorable, too. I'm horrible with bows, but I'm happy with how everything turned out. After I cut everything out, I attached the mice heads with foam tape. I also used glow in the dark puffy paint for the white dots. They don't dry stark white, but you can still tell they're polka dots, plus, they glow in the dark. What kid wouldn't love that? All the shapes I used are from CCR Basics. I used CCR to weld three scalloped circles together to make the heads. The heads are approx. 1.5 inches, and the cupcake shape is a little larger than 2 inches. Hope you enjoyed my Disney project, and it stirs some of your own creative mojo. 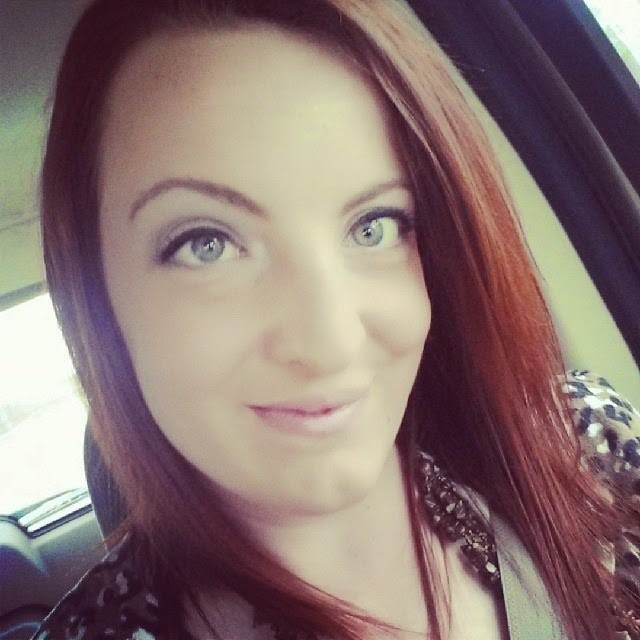 Next, please head on over to Melanie's blog. Those are adorable. Thanks for sharing. Super super cute cupcake topers. Glow in the dark polka dots, who is the coolest GodMother EVER!!! You make Cinderella's take back stage, lol! Thank you for sharing! Don't you LOVE the welding feature!!! I love your project...you are right, what child would not be enthralled with it, when i would even like to be there? Thanks for sharing. Awh!! How cute!!! love it...just signed up as your newest follower. Enjoyed being in a hop with you and hope that we can hop again together sometime. 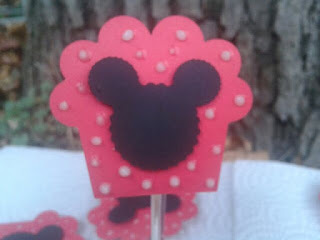 These cupcake toppers are super cute, love them. Thank you for sharing and for hopping with us. 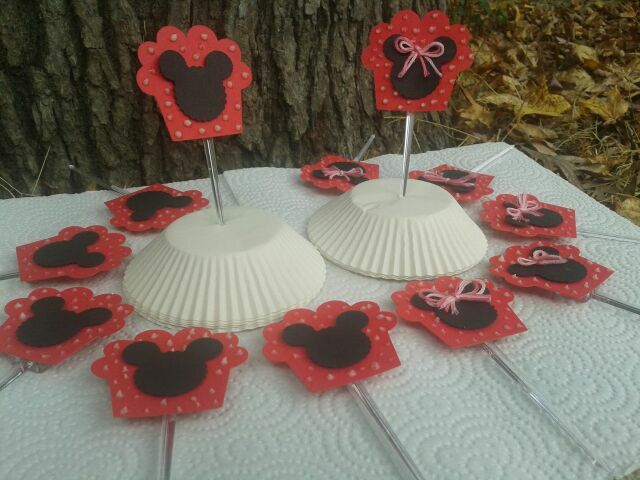 Very cute cupcake toppers!! Mickey Mouse is my favorite too! Super cute disney project, I love disney I even have a Mickey tattoo on my shoulder. TFS!